The response time of pressure sensors is reflected in a large number of varying parameters, such as the response time, settling time or rise time in specifications or data sheets. In general, it can be assumed that the response time is defined as the interval required by the output signal of a pressure sensor to display a change in the applied pressure. Of greatest practical relevance is the so-called rise time. The graphic shows a simplified diagram of a steplike change in pressure (shown in blue) with a time-delayed change in signal of the pressure sensor (shown in red). For the sake of simplicity, the picture only shows an ideal situation. 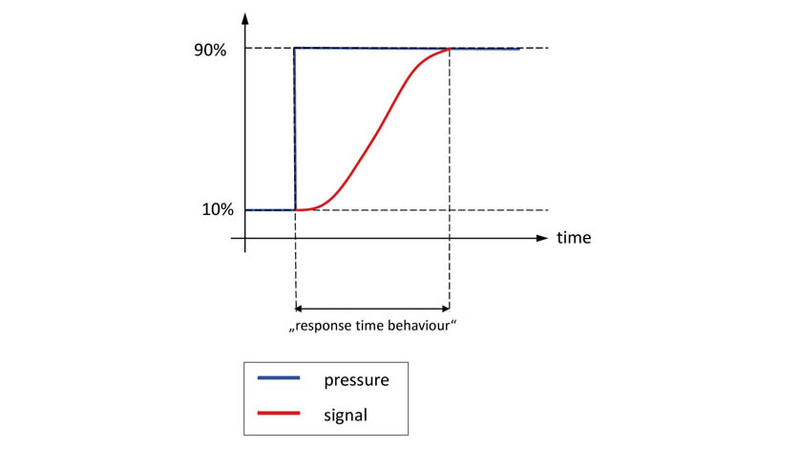 In reality, the response time of pressure sensors contains further influencing factors, such as dead time or overshoot, due to their particular constructive setups. Common data sheet specifications on the response time usually contain additional data regarding the test conditions applied, such as T90 or 10 … 90% (used below for exemplary calculation). This information defines the interval in which a steplike change in the applied pressure from 10 to 90% of the full span (e.g. from 60 to 540 bar for a 0 … 600 bar pressure sensor) leads to a defined change in output signal of 10 to 90% of the final value (e.g. from 1 to 9 V at an output signal of 0…10 V). The standard design of modern pressure transmitters already allows rise times of ≤ 2 ms. However, special forms (such as submersible pressure transmitters) may also show clearly higher values of ≥ 100 ms on purpose. The basic rule is that in applications with high load cycles, such as in mobile hydraulics, short rise times are recommended, whereas in slow applications, such as level measurements by submersible pressure transmitters, long rise times are usually advantageous.